We have full time staff on over 350 customer sites across South Africa. 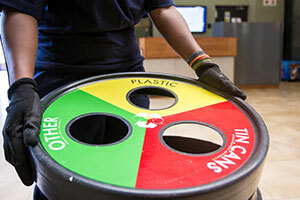 Our teams provide on-site recycling and waste management services to health care providers, the food &beverage industry, universities, shopping centres, office parks, distribution centres, hospitality and manufacturing sites. Our services are shaped to fit your needs. We take care of waste while you take care of business. When your company’s reputation is on the line, you want to ensure you’re getting a fast, reliable service. We understand this and project manage every site to ensure your waste has the lowest possible impact on both the environment and your business. And, if you have an emergency that needs immediate attention, our experienced team will be there to assist no matter the time or day. 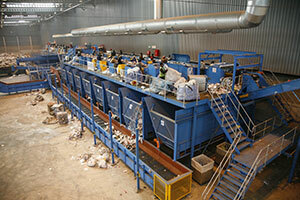 Did you know that up to 90% of waste can be reused, recycled, or repurposed? 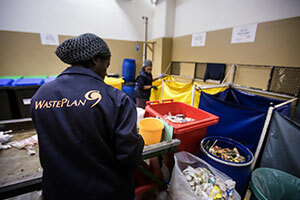 When you choose WastePlan as your waste reduction partner you’ll get a sustainable waste reduction solution that keeps the environment in mind. We don’t just move waste, we find value in your waste and take the time to sort it properly so that your company’s waste is not contributing to growing landfills. 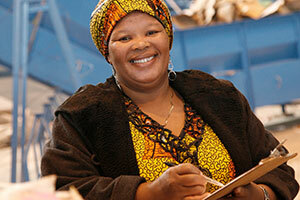 South Africa has very robust and progressive waste management legislation. Staying up to date with the latest rules can be a burden. It’s our business to ensure your business not only complies with the legislation but can also prove that your waste is handled responsibly. Your waste has value. The act of recycling means that your waste is being transformed into something else, which can then be sold. We work with you as a partner in the goal of zero waste to landfill, that’s why when we recycle your waste, we make sure you get a rebate on every kg sent for recycling. You’re well aware that you can be fined for not removing your waste properly. With both the restrictions of waste going to landfill and the cost of moving it increasing, you want a sustainable solution that helps you save money and reduce your waste responsibly. With our goal of reducing waste to the minimum, we help you save money on the resources you would need to do it yourself. We understand that it’s important for you to have a full view of your business’ environmental impact – that’s why we offer accurate data reporting at the click of a button. We use a web-based reporting system to make sure you have accurate, up-to-date data on all your waste reduction efforts – ensuring you’re always in the picture and never left surprised. Our on-site services are designed to save you money, keep you compliant, and reduce your waste to landfill. Every time you throw something away, you’re only adding to the landfill. But when you recycle you can help grow the economy . From an environmental perspective, zero waste to landfill means less of a negative impact on our climate and less pollution. As a business, reducing your waste is important, but how much waste can you reduce and how much do you actually have?